The Piaggio Ape recently celebrated its 60th birthday in Italy as the first of these vehicles was launched in 1948 based on the Vespa scooter. Today, Ape is available for the UK market in the 50cc petrol, TM 218cc petrol, TM 422cc diesel and the special Calessino versions. 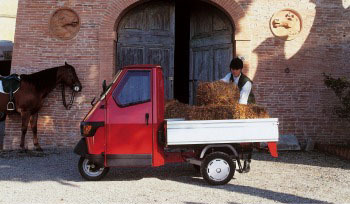 In 2007 Piaggio reintroduced a limited edition version of the Ape Calessino, a truly unique vehicle of which only 999 will be available. Perodua UK Limited, the importer of Piaggio Commercial Vehicles into the UK, are delighted to announce that they are now adding the popular Ape range of 3-wheel vehicles to their existing line up of light commercial vehicles in order to appeal to a wider market. Ape recently celebrated its 60th birthday in Italy as the first Ape was launched in 1948 based on the Vespa scooter. 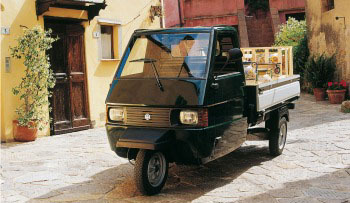 Corradino D’Ascanio, the designer of both the Vespa and the Ape, designed Ape when he realised the demand for a compact light commercial vehicle in Italy. The result of this unique design and Ape’s unbeatable versatility has led to sixty years of success for Piaggio as Ape is now recognised and admired worldwide. Since the first Ape was introduced, there have been many welcome developments with the range. The first evolution came in 1952 when the displacement of the Ape increased from 125cc to 150cc resulting in a higher load capacity. Then in 1954 the Ape C was launched, which was a small truck able to carry up to 350kg. In 1958, the Ape D came along which was bigger than previous models with a displacement of 170cc and also saw the introduction of the cab complete with doors. The Ape TM, still in production today, was launched in 1982 and was a completely new concept as the dimensions of the vehicle and cab were bigger resulting in a larger payload, plus the option of a steering wheel made it more comparable to a traditional 4-wheel commercial vehicle. In 1984, the 422cc diesel engine with 5 speed gearbox was introduced further broadening the range. 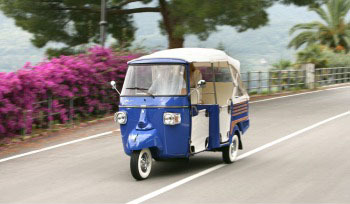 In 2007 Piaggio reintroduced a limited edition version of the Ape Calessino, a truly unique vehicle of which only 999 will be available. The Calessino was incredibly popular during the 1950’s when Hollywood stars used them as a runabout at exclusive holiday resorts on sunny Mediterranean islands. The latest version is an ideal reinterpretation of the design that was admired in the 1960s with its blue body, wood inserts, cream upholstery and chrome finishes. Today, Ape is available for the UK market in the 50cc petrol, TM 218cc petrol, TM 422cc diesel and the special Calessino versions. The use of Ape is longer limited to the world of work and is becoming more popular as a method of personal transport. Ape 50 is available as a Panel Van, Pick Up or Cross and is ideal for deliveries in busy towns as it can travel down narrow streets and park in the smallest of spaces. The most functional use for Ape 50 is as a marketing tool for businesses, as its unique design is guaranteed to attract attention from passers by whether stationary outside a shop or on the move. Ape TM is available as a Panel Van, Pick Up or Tipper and has a choice of either a 218cc petrol or a 422cc diesel engine¹. The Tipper and Pick Up also have the option of a steering wheel² or handle bars. TM has an impressive payload for such a compact vehicle and although larger in size than the Ape 50, is still easy to manoeuvre with a turning circle of just 3.4m. The load volume of the Panel Van is a surprising 2.5m³ making it useful for delivering goods. The Ape Calessino meanwhile is ideal for leisurely drives in the country or by the coast with its fold down hood. The limited edition design makes it perfect for lovers and collectors of the Ape brand. Prices for the Ape range in the UK start from only £3,595.